Jonas Mortensen wants to be liked. Adam Fletcher wants to be forgotten. Jonas, a freewheeling Norwegian, has been living in a quiet English village for years, an eccentric everyone has an opinion about. Then the real owner of his house turns up. Fletcher, a traumatised veteran of the Afghan War, has come to claim his inheritance. The two men live side by side in an increasingly bizarre standoff, until a teenage girl goes missing and suspicion falls on Jonas. As the hunt intensifies, it’s clear both men are concealing past lives that won’t stay hidden much longer. ‘A sometimes beautiful and eerie book which looks at the strangeness beneath modern life in a style reminiscent of Alan Warner or Jon McGregor. The author knows how to peer into the lives of his characters with an unsparing eye, finding the warmth and horror that surrounds us all.’ Alan Bissett, author of the Moira Monologues. ‘A captivating triumph that confirms the arrival of a blistering new talent on the Scottish literary scene.’ Daily Record. ‘A deftly written and truly gripping thriller in which two men with mysterious past lives meet in an English village with dramatic and violent consequences. A skillfully crafted and inherently absorbing read from beginning to end, “A Private Haunting” is highly recommended.’ Midwest Book Review. ‘In this taut, terrifying tale of loss from McCulloch, readers are never sure whether one or both of his lead characters is a cold-blooded murderer, a victim of unfathomable tragedy, or perhaps both. Surprising bursts of humor lighten a narrative that is otherwise suffused with death, sorrow, guilt, and madness.’ Publishers Weekly. ‘Nicely weighted thriller by rising talent- FOUR STARS.’ Jon Wise, Sunday Sport. ‘Tom McCulloch is building a growing reputation as a novelist.’ The Inverness Courier. 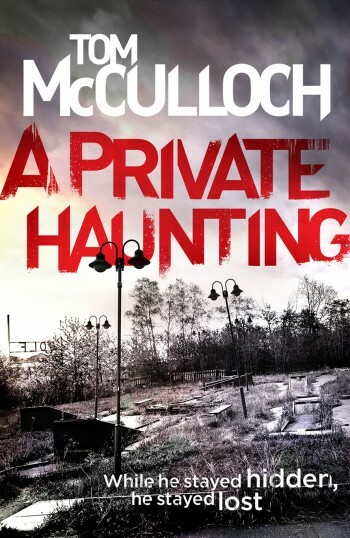 A Private Haunting is available to order from Waterstones and Amazon .